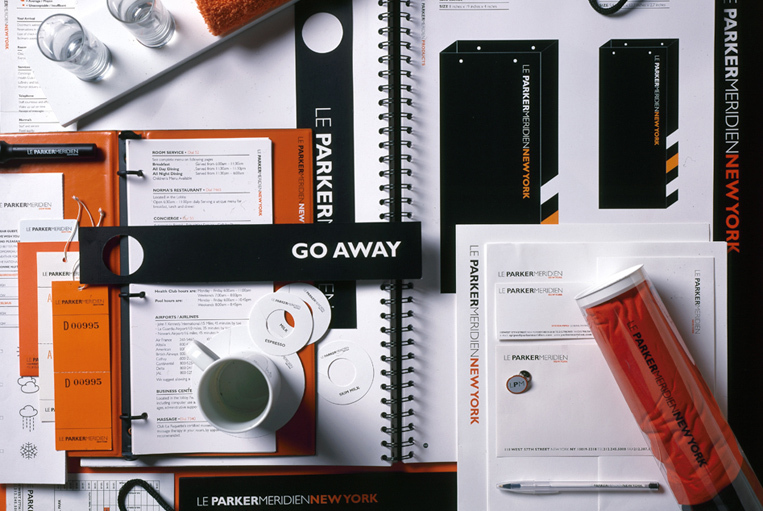 Working with Paula Scher and her team at Pentagram, we developed a new brand identity for Le Parker Meridien, the New York flagship of the Le Meridien luxury hotel chain. Already a favorite for its high level of service, Le Parker Meridien wanted to develop a distinct personality that would prove memorable to guests, ensuring repeat business. To this end, we created a visual identity and in-room amenities that help make the hotel witty, brash, and elegant––like New York itself. In a city of skyscrapers, the identity fittingly accomplishes this through scale, by lengthening the proportions of the hotel’s signifiers and hospitality items. (The long dimensions are also suggestive of the outsized columns in Le Parker Meridien’s lobby.) Shopping and laundry bags, shoehorns, signage, and hangtags are stretched out to charmingly absurd proportions. 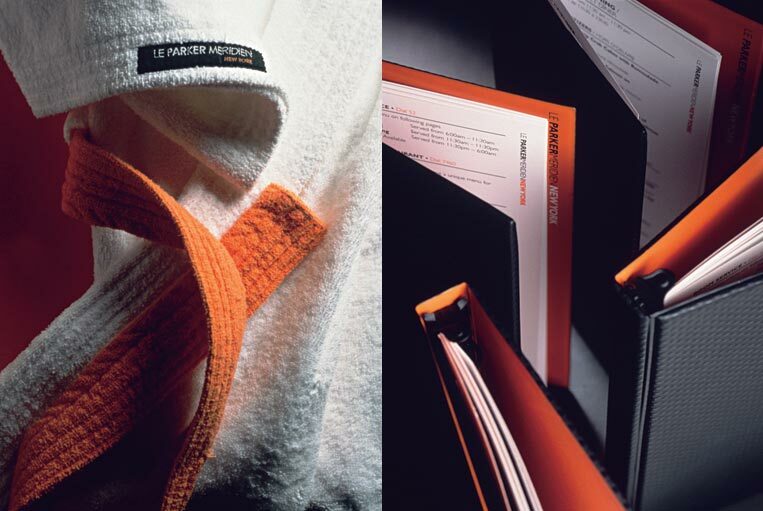 The hotel’s name is streamlined into a single length of type; the identity presented in a sophisticated color palette of black, white and orange. 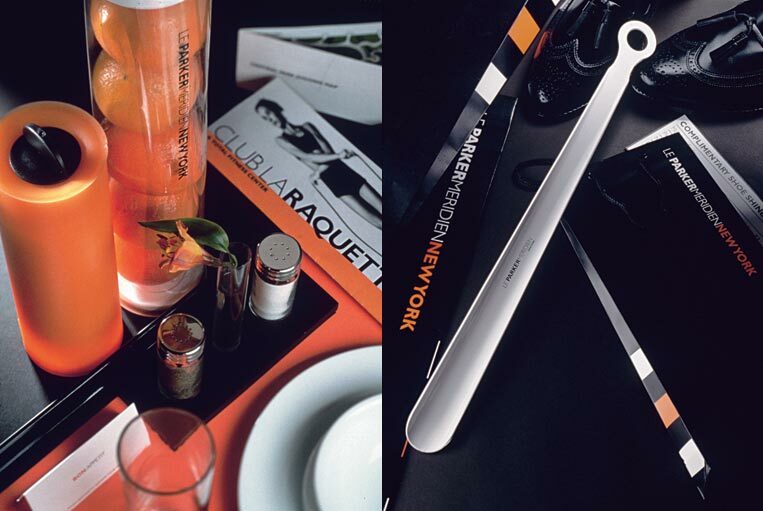 In-room amenities are elegantly held in a series of long, transparent tubes created in collaboration with the product designer Ayse Birsel. A pleasant surprise for guests, these capped containers are filled with unexpected touches like fresh fruit and jellybeans (used for a turn-down on the bed.) A set of test tubes is found in the bathroom, conveniently filled with lotion, shampoo, toothbrush, shower cap and bath beads.